Ladies, Classic Dupattas on Commercial Street is where you need to head to when you need to ace your duppatta game. From your run-of-the-mill net dupattas to more exquisite Chanderi dupattas, their extensive collection will only set you back by a few hundreds! If there’s ever an accessory that can make your lehenga look mehnga or your kurti look pretty, it’s the dupatta. And ladies, this quintessential Indian accessory is available in all kinds at this wonderful place on Commercial Street. Classic Dupattas, a quaint little shop located just behind Mysore Saree Udyog is your go-to place for scoring some really cool dupattas. 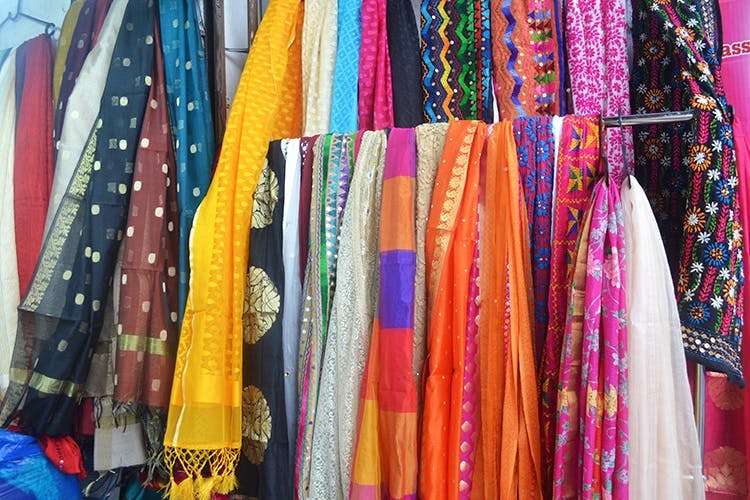 And since it’s on Commercial Street, you’ll find the prices are the friendly kind, so guilt-free shopping guaranteed when you start or add to your collection of dupattas. When we said that they stock up on all kinds of dupattas, we weren’t kidding. From your run-of-the-mill net dupattas to more exquisite Chanderi dupattas, you’ll spend quite some time going through the stacks and rolls of dupattas of every colour, design, and fabric possible. While their collection of Phulkari and Chanderi stoles sell like hot cakes, you’ll find patrons browsing through net, georgette, Banarasi silk, chiffon, velvet, zardozi, Kalamkari, and cotton silk dupattas as well. These colourful accessories start from as low as INR 200 and can go all the way up to INR 1,600. If you are looking for something fancy, then we’d suggest the more expensive ones, but for everyday use, it’s the lower priced stoles that you want to go for. The place gets super crowded during weekends especially after noon, so be sure to go there a bit early. They also have another store on Ebrahim Saheb Street that’s parallel to Commercial Street. You might want to check that out too.